LAGOS MARCH 20TH (NEWSRANGERS)-Boko Haram fighters on Monday invaded a first generation bank in Michika Local Government Area of Adamawa State, destroying property and carting away cash. An eyewitness said the insurgents came through the mountains to attack the town, causing pandemonium as people ran in different directions to escape being shot. A resident, Emmanuel Kwache, said the terrorists had an easy access to the heartland of the area before the Nigerian troops were alerted to respond to the invasion of the insurgents who we’re firing sporadically everywhere. The police in Adamawa confirmed the attack through the Public Relations Officer, SP Abubakar Othman, who also confirmed that there were many casualties as the insurgents made a failed attempt to retake the town. It was also learnt that Nigerian military troops stationed in Michika mobilised to repel the terrorists back to the mountains where they live. 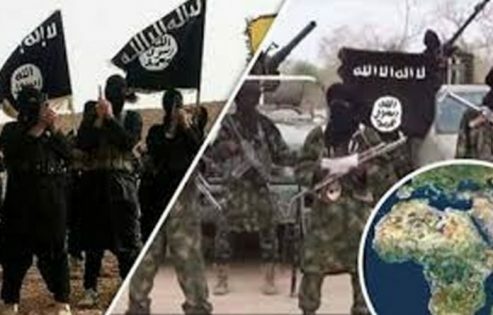 One Zirra Vandi said about 3p.m, Nigerian time, on Monday, Boko Haram troops in their thousands invaded the town and headed to the first generation bank branch, and that troops did not respond to the attack until 7.30p.m. Military sources, however, said about 7:20p.m, gallant troops of the 115 Task Force Battalion deployed at Lassa in Borno State received a distress call from vigilantes at Maikadiri village on movement of suspected Boko Haram fighters along Maikadiri – Shuwari en route Michika. The troops immediately organised blocking positions and swooped on the terrorists which led to exchange of fire. The terrorists attempted to escape but were intercepted and suppressed with heavy volume of fire. According to military sources, the gallant troops, with reinforcement from 143 Battalion, Gulak, engaged the terrorists on two fronts coordinated attacks. The Boko Haram fighters were completely routed by the troops, neutralising many of them while others fled in disarray. Military sources further said as a result, they hastily evacuated most of their corpses under the cover of darkness. The military said the entire area had been dominated by its troops and that the situation was completely under control. Items captured from the terrorists include one Ford vehicle, two Toyota Starlet vehicles loaded with foodstuffs, one motorcycle, and one tyre inflating machine. Sources in Michika said calm was yet to return to the city and that inhabitants of the town were still fleeing from Michika due to scores of dead residents after the attack. Most of those who escaped have been heading to Mubi and other towns.